The dream team for prosthetics. Carbon Braid and OP-TEK® Flex Comfort combine strength and comfort to make a great team for your patients. Carbon Braid is stocked for immediate delivery and available in three weights: 12K standard, 6K lightweight, and 3K ultra-lightweight. OP-TEK Flex Comfort is a great option when less friction is desired. It is easy to fabricate and maintains consistent walls when formed. Hide trim lines against carbon fiber sockets with OP-TEK Flex BiLam that offers comfort and improved aesthetics. The new line of lamination adapters are made from high-strength, lightweight titanium or stainless steel. New products include three- and four-prong anchors with a variety of adapters and a four-ear socket adapter. The versatile designs are easy to use with both thermoplastic and laminated sockets and a one- or two-stage lamination process. Designed and manufactured by College Park in the United States, the entire line of endo components are engineered with premium materials and special noise-abatement features for superior outcomes and peace of mind. View all lamination kit options and order online at www.college-park.com/lamination. Fabtech Systems and Extremiti 3D are happy to announce a new strategic partnership with the goal of providing the highest quality 3D-printed prosthetic devices to the O&P profession. 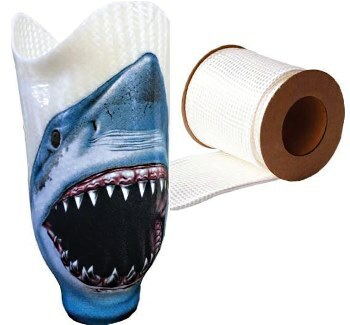 Products provided include protective covers and transtibial and transfemoral sockets.